I’m a huge fan of John Templeton. He was one of the greatest investors of all time and shared a wealth of knowledge with us like the quote above (and this other one I wrote about just over a year ago). Some have used this quote recently to suggest that because we haven’t yet seen any signs of euphoria the bull market still has plenty of room to run. I have a different take. I have argued recently we have actually seen plenty of signs of “euphoria” including a record streak in extreme bull/bear readings in the Investors Intelligence survey, a record high in the Rydex bull/bear ratio, a record high household equity allocations relative to money market fund assets and a record high margin debt levels, both in nominal and relative (to GDP) terms. But let’s look at the actual definition of the word. a state of intense happiness and self-confidence. psychology. a feeling of happiness, confidence, or well-being sometimes exaggerated in pathological states as mania. In using the Templeton quote to determine where we are in the sentiment cycle, we are looking for are signs of ‘intense or exaggerated confidence’ as a warning the bull market may be running out of steam. 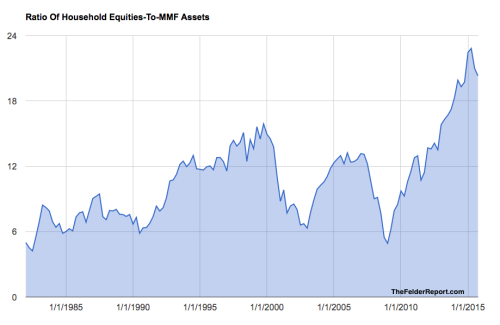 As noted above, households currently have one of their largest allocations to the stock market in history. 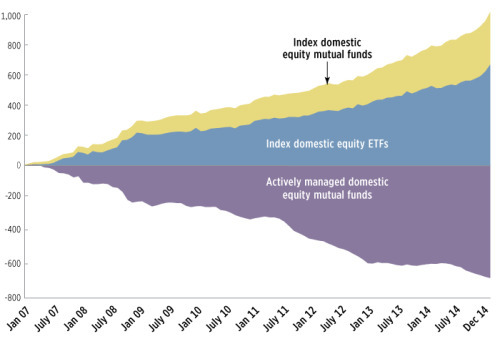 In fact, over the past thirty years they have never allocated more money to stocks relative to money market funds. If this isn’t a clear sign of confidence in the stock market I don’t know what is. Still, some point to persistent outflows out of equity funds as a sign investors are far from “euphoric” about the stock market. The trouble with this line of thought is if investors were pulling money out of the stock market due to lack of confidence in the stock market then their allocations to equities relative to other asset classes would have to fall. That’s just not the case. This leads me to believe the persistent outflows are more a product of two major trends. First, there is a major demographic shift going on in our country right now. As baby boomers continue to age and the demands on their capital grow, we will likely see continued outflows. Still, it appears that even as they do make withdrawals they are maintaining an extremely high allocation to equities, suggesting they are as ‘intensely confident’ about the stock market as they ever have been. Second, it’s also very important to put these outflows into context. While actively managed mutual funds have been losing assets for years, passive index funds have gained even more assets than those funds have lost. In other words, investors are largely abandoning traditional investment strategies, for price-insensitive strategies. To me, this shift suggests investors are hardly losing confidence in the markets. In fact, it’s just the opposite. Rather than apply traditional price-sensitive strategies in order to achieve adequate risk-adjusted returns, investors are abandoning this practice and simply putting their faith in the providence of the markets. And it’s hard to imagine a greater sign of confidence in the stock market than this. So, not only do investors maintain extremely high allocations to equities today, those allocations are now directed at price-insensitive strategies, which rely on pure faith in the providence of the markets, to the greatest degree in history. To claim this is not ‘euphoric’ behavior, or an expression of intense confidence, is simply to misunderstand the meaning of the word. There are a large number of signs that investors have recently become euphoric, by this definition, and in some respects to the greatest degree we have ever seen. In the spirit of Sir John’s quote, I would suggest this is a very clear warning sign that the bull market has largely run its course. Furthermore, once investors do begin to lose confidence, all of these indicators show the long-term sentiment cycle has a long way to go before investors truly become pessimistic again and a new bull market can be born.